Hdac Technology (Hdac) has unveiled ‘H-UMBA,’ a blockchain adapter which enables compatibility between heterogeneous IoT platforms. The objective is to provide converged Blockchain-IoT services. 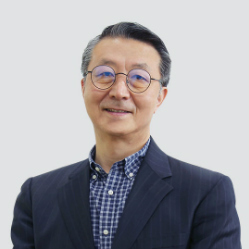 Hdac was founded by Chung Dae-sun, the CEO of Hyundai BS&C. “We have developed the blueprint and key technologies of our BaaS (blockchain-as-a-service) platform for enterprises, which marries the strengths of the IoT and blockchain, based on our public-private hybrid blockchain platform ‘Hdac’. 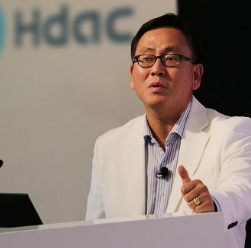 Hdac BaaS will enable companies with either blockchain or IoT capabilities only to easily implement services which combine both technologies,” said John Sang-Ug Bae, Chief Operating Officer of Hdac. ICBM (IoT, Cloud, Big Data, and Mobile) is the promising core technology of a ‘next ‘industrial revolution’ in industrial markets. Many expect IoT not only to expand access but also to increase efficiency and convenience for users with various economic values. However, in order to achieve a positive outcome, connectivity between devices and reliability must be present. Removing distrust and security threats, implied by the convenience of Internet connection, is a top priority. When accomplished, the most attractive attributes of IoT come into play – the enabling of devices which are smart and connected. The downside is that devices which were not created for use on the blockchain will likely be neither smart nor connected. This means the threats and vulnerabilities that may occur in existing Internet environments will persist. To bypass this it is necessary to contract and operate between a reliable P2P network system and IoT devices. This will require an evolution with the capacity to become a network able to support an ultra-advanced M2M transaction system which can function securely, reliably, and independently with customisable inputs from users. Integrating blockchains with IoT implements confidentiality with integrity. This is a necessary condition for ensuring reliable connections and secure processing between devices. To achieve this, connected devices must be able to respond to fabrication and modification attacks. Blockchain, as a technology, contains an inherent ability to cope with external attacks through its exploitation of complex mathematical encryption of blocks on the transaction ledger. In addition, blockchain uses a decentralized rather than centralized approach. This has the advantage of making it difficult for hackers to determine the attack target. Combined, these operate to minimise the impact of individual attacks on IoT devices. authentication and authorization procedures; these are necessary for IoT devices involved in transactions. in the case of a public blockchain, increased efficiency of construction and maintenance; widespread decentralisation of a public ledger improves efficiency by reducing transactional costs. If implemented, this can offer a network which uses blockchain to provide the reliable environment for both administrators and users. Both can exchange a wide variety of data and value. connect them into a blockchain network. This compatibility issue has been a major obstacle to commercializing IoT and implementing a blockchain convergence model. To address this challenge, Hdac developed the H-UMBA (Hdac Universal Multitenancy Blockchain Adapter) by adopting the concept of an abstract blockchain layer. H-UMBA is a platform architechture designed to manage and broadcast control information between heterogeneous IoT devices to their desired blockchain transactions. Hdac says this is a key technology for Hdac’s BaaS solution. 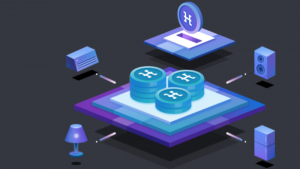 A Hdac private blockchain provides installation and configuration functions, with blockchain configuration defined by users. For example, a new node configuration happens with only a single line command which enables participation in an existing blockchain as a full node. Enhanced multi-user signatures support services such as secure P2P transactions. This also provides the ability to communicate, by creating encrypted channels between two specific users. Hdac also has its ASM (Advanced Security Module). This is a hardware module designed to secure the seed node generated first on a private blockchain. With ASM, users obtain more robust security by adopting the Quantum Random Number Generator (QRNG). This enables enterprises to build more reliable services. 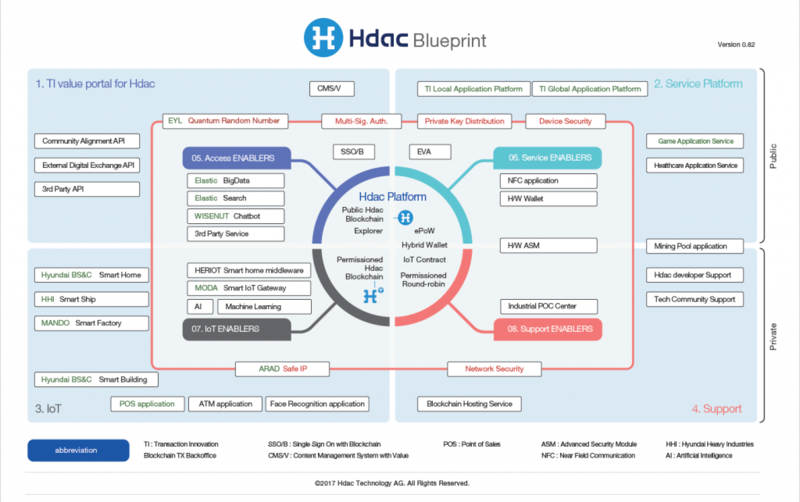 Hdac plans to offer an adapter package which supports multiple IoT platforms and blockchains in order to allow for timely development and universal usage. The company has filed a patent application for H-UMBA in Korea. It is in the process of doing the same in key countries including the USA, the UK, and Germany. IoT deployments are in full flow in large enterprises. But most IoT implementations are private, the property of the implementing organisation. Security is as good, or as bad, as that implemented in that enterprise. Hdac’s H-UMBA would appear to bridge an acknowledged gap, by introducing blockchains. If proven, this could be a significant extension to IoT and the provision of ‘more public’ access (than is available via today’s mostly private IoT networks).